We will launch Notes Books Authors 10 Willingly to war by Andrew Francis, winner of the 2005 Friends of the Dorothy Neal White Collection Scholarship. You will recall that Andrew spoke to the Friends about his research in November 2006. Willingly to war expands upon that presentation. The event will be held on Wednesday 19 September 2007 at the Susan Price Collection (SPC) in Susan’s home at 24 Glasgow Street, Kelburn. Drinks & nibbles will begin at 5.30pm & will be followed at approximately 6.15 pm by the book launch. Susan will then talk about her collection and you will have an opportunity to browse the SPC. Friends, & their friends, very welcome – a gold coin donation from non-members would be appreciated. PLEASE NOTE THE CHANGE OF VENUE! And mark your diaries now – we will have a Christmas event on Thursday 29 November. We had a different from usual venue for the Annual General Meeting of the Friends on Tuesday 15 May 2007. We met in the main National Library foyer for preliminary drinks and nibbles (see the accompanying photo for the winner of the “most inventive baking” prize! Congratulations Barbara Robertson) and then moved to the Gallery for the AGM and presentation from Peter Ireland (see next page). Mystery #1: A cat is searching for its home in a street and eventually finds it. Read in the mid 1950s, so published before 1955, we think. And it definitely is a cat, not a dog or any other animal. Mystery #2: A dog, called Doggerell (not sure of the spelling) who could change into a block of wood. Also read in the mid 1950s. Mystery #3: A boy is sent to the letterbox every day, but is reluctant to go and makes excuses because he is worried about monsters, but the dragon turns out to be a lizard, hyenas are dogs, etc. The client thinks it is a New Zealand book, though it may be Australian. She read the book to her children (born 1979 and 1983) when they were small, so it must have been published before 1985. If you can help answer these queries, please either email lynne.jackett@natlib.govt.nz or write to me at National Library of New Zealand, P O Box 1467, Wellington 6140. I am way during September, so writing is better than ringing. The new display in the Dorothy Neal White Collection case in the Ground Floor Reading Room, Ameliaranne and the constant illustrator, celebrates the Ameliaranne books, published between 1920 and 1968. 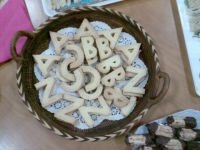 The display topic was inspired by the happy coincidence of discussing favourite books from childhood with my elder sister (she empathised with Ameliaranne, as she too is the oldest child in a large family – but our mother was not a washerwoman) and receiving a donation of four of the earliest titles from Mona Sowerby. The illustrations are quaint and charming, and I thought others might appreciate seeing them, too. I can find very little written about them. Susan B Pearse (1878-1980) illustrated all the books but eight authors wrote the stories. The display will be in place from late August to December. This year I celebrated my 35th wedding anniversary. 2007 is also the anniversary of another significant event in my life, because 30 years ago – 9 am on January the 12th, to be exact – I met the second “love of my life”. That was when I was introduced to the School Library Service Head Office Collection, now known as the National Children’s Collection. My job was to review and recommend books for the School Library Service Collection. Yes, I was paid to sit and read books. Sounds too good to be true? Well, it was, but it took until 1994 for the “readers” jobs to disappear. 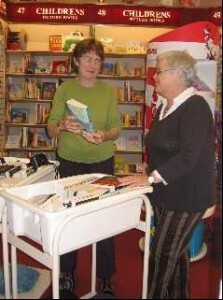 In the May 2007 issue of Around the bookshops Jeannie Skinner, Library Adviser with the National Library’s School Services, described her job under the title “Out and about”. My job (The Dorothy Neal White & National Children’s Collection Research Librarian) could perhaps be described as “Banished to the basement”. But that is not a bad thing as, although I cannot even see a window, let alone look out one, it is a great place to be. Why? Well, I work next to two large collections of children’s books – together they form the largest research collection of children’s books in the Southern Hemisphere. Both the Dorothy Neal White Collection (DNW Collection) and the National Children’s Collection (NCC) contain books published not only in New Zealand, but also books from England, the USA, Australia and Canada. 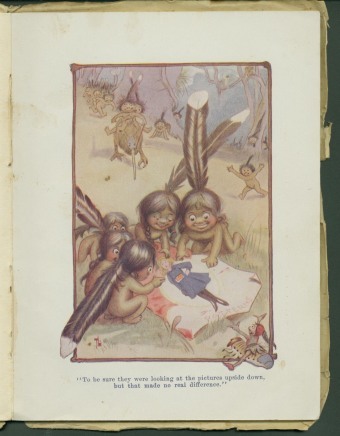 If the DNW Collection contained solely New Zealand children’s books, it would be very small as there were only 150 New Zealand children’s books published up to 1940, the collection’s close-off date. Instead, it contains about 8,000 pre1940 children’s books. Most of these are storybook fiction, with a smallish number of picture books. There are also about 1,500 non-fiction books, supposedly of a recreational nature, but children must have been very different then if they were that interested in improving and religious books and not very interested in sporting and nature books! A highlight of the DNW Collection is the annuals and serials section. These are mostly big volumes of British weekly or monthly papers (such as Boys Own, Girls Own and Chums) that were bound together each November and shipped off to the colonies in time for Christmas. It was impractical for weekly papers to be shipped around the world in the days of sail and early steamships. We also have more recent annuals – like Eagle and Girls Crystal – that were not compilations of the weekly papers but were specially published just for the Christmas market. One of the reasons for having this collection is to reflect the influences that have helped shape the New Zealand identity and the experience of growing up here. Librarians like to claim that what we read as children helps shape the adults we become. Imagine how delighted we were when Alan MacDiarmid, 2000 Nobel Laureate for Chemistry, identified a children’s book as the early influence that led him to a career in chemistry. This book was so good, that, once he found it on the new books shelf at the Lower Hutt Public Library, he kept renewing it for almost a year so that he could complete most of the experiments. You can view a digitised version of the DNW Collection copy of The boy chemist by Archie Frederick Collins on the Royal Society of New Zealand web site. (http://wellington.rsnz.org/news.htm). When I met Alan, he told me his favourite experiment was creating invisible ink from lemon juice. Many of the books in the DNW Collection have inscriptions showing they were given as birthday or Christmas presents, or bookplates showing they were received as school or Sunday school prizes. Few children then had the luxury of sufficient pocket money to splurge on books. I am frequently asked how the DNW Collection got its name. It began life, in the late 1970s, as the Children’s Historical Collection, but we later decided to rename it in honour of Dorothy Neal White, one of New Zealand’s first and most influential children’s librarians. In 1936 Dorothy Neal was awarded a Carnegie Fellowship in librarianship to study children’s library work. Upon her return to New Zealand in 1937 she was appointed children’s librarian at Dunedin Public library. This library and books she wrote helped shape public libraries’ collections and services and the collection that is now the NCC. The National Children’s Collection contains about 100,000 children’s books. It is split roughly into 30% storybook fiction, 30% picture books and 40% non-fiction. We currently add a copy of all children’s books published in New Zealand (received on Legal Deposit) and I purchase notable books published overseas. These include award-winning and highly popular books, and I try to acquire all books by modern luminaries such as Anthony Browne. Because the collection has existed since 1942, and because the SLS Selectors did such a splendid job for five decades, it is full of books that jog treasured memories among most visitors. Even people who claim to have had little interest in books as children usually emerge from the stacks clutching some forgotten treasure. It may be a Janet and John book encountered as a reading book, an information book full of fondly remembered experiments (many of which would no longer be promoted because of health and safety considerations!) or a beloved picture book with entrancing pictures. Since we changed its status to a research collection in 1996, I have been padding out the slender numbers of books by highly popular but critically derided authors such as Enid Blyton and Captain W. E. Johns of Biggles fame. As someone who has only ever read one Noddy book (twice, and it hadn’t improved any in the 45 years since I was 3), I was somewhat dismayed to hear myself described as “The Noddy Lady” by the daughter of a colleague. This is because I have received several gifts of Noddy and Big Ears figurines and brooches and they are all displayed in a cabinet beside my desk, along with some Wild Things and Winnie-the-Pooh soft toys. These toys evoke fond memories for many visitors. 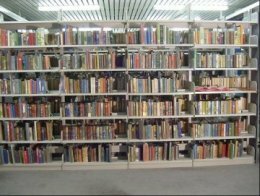 There is a third special collection of children’s books owned by the National Library – the 20,000 book Susan Price Collection. Susan continues to add to this collection (of her selection of the very best in children’s literature) and it is housed in her home. You can visit this collection by making an appointment with Susan (phone 04 475 8092). Those are the collections, so what do I do? These days I spend most of my working days at a desk facing the front of the NCC storybook fiction shelves. I answer people’s questions about children’s books – mostly by email or phone. These can be fairly easy questions such as all the books written by a particular author. Some requests for books on a theme are also fairly easy to answer, if they are on a subject that allows me to search on our catalogue. The more difficult queries to answer are those where the theme is not noted in catalogue records – such as all the books we have featuring people of a single nationality, not just as the main protagonist, but as incidental characters, too. Some of the most difficult questions to answer are those where people recall a book from their childhood, but don’t know the title, or the author and are a bit unsure of the characters and the plot but are sure it had a green cover … or perhaps blue! Sometimes they just recall how the characters were dressed! I’m always amazed when we actually find the book – and we quite often do. I have to give credit to a wide circle of colleagues, many now retired, who have a remarkable ability to recall books they last read 30 or 40 years ago. Ask Me! Roving information at the 2006 Storylines Festival, Wellington. What else do I do? I assist researchers visiting to use the DNW Collection, most of whom are completing an academic assignment or thesis, or writing for publication. Current researchers include people looking at Kiwi iconography in early New Zealand children’s books and others studying imperialism in British and New Zealand books from the late Victorian and Edwardian periods. Children’s literature is still a fairly new subject for academic research (courses mostly began in the 1990s) and it is even more recently that people have realised how useful children’s books can be for research into historical, linguistic, illustration and design or social science, not just for children’s literature topics. Children’s books tend to be fairly quick to read and themes and attitudes are often more baldly stated than they would be in books for adults. Many of the books would be considered politically incorrect (or just outdated) today and would be weeded from a school or public library collection, but we keep them as examples reflecting their time. It is interesting to see that formerly banned books such as Little Black Sambo are gaining a new life with new illustrations and renaming of characters in books such as Story of little Babaji by Fred Marcellino and Sam and the tigers by Julius Lester and Jerry Pinkney. It always seemed a pity that such a ripping good story was unavailable to new generations, largely because of Helen Bannerman’s rather inept illustrations and the characters’ names. Lester and Pinkney, both of African American descent, felt the same. However, they changed Sam’s ethnicity from the original Indian and set the book in the American South, as that is where they had thought it was set when they encountered it in their childhoods. I also host people who just want to come and have a look at the collections for nostalgia purposes. Visitors should make an appointment with me, as I work part time, but if I am here and not already hosting a group, I can usually make “instant” appointments. Frequently, I am asked to give illustrated (slides) talks to groups such as the University of the Third Age, Probus, and book groups, either in the library building or out at their regular meeting place. Groups of design students also visit regularly and we look at good picture book design. I also enjoy hosting groups from the Institute of Modern letters at Victoria University and look forward to some of their books gracing the NCC shelves some day. 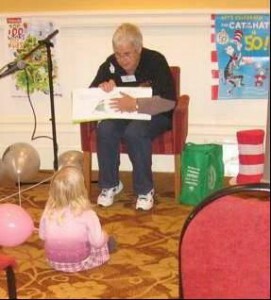 Most years, I also make a presentation to a children’s literature conference or workshop. These are usually in New Zealand but the furthest away of these was in Toronto in 2003, just as the SARS epidemic was waning. The audience was aghast when I showed them an early New Zealand children’s book by Isabel Maud Peacock called . Piccaninnies. That is definitely a “non PC” term. That provided the opportunity to point out that one of the great values of research collections is that they are not weeded to accommodate changing moral climates, but preserve the books so future users can explore the attitudes of previous eras. Small displays of children’s books for a display cabinet in the National Library’s ground floor reading room are a really enjoyable responsibility. They provide me with an opportunity to become the researcher, extracting information from the collections and presenting it to others. As I write, a display of counting books is about to be replaced by one featuring the “Ameliaranne” books, illustrated by Susan B. Pearse, but written by a variety of authors. Recently I have also celebrated the books by Edward Ardizzone (the “Little Tim” books) and cautionary tales such as Hilaire Belloc’s Matilda who told lies and was burned to death and Jim, who ran away from his nurse, and was eaten by a lion. 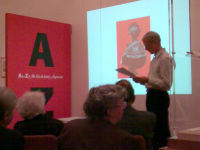 Books from both collections are also used in the larger National Library Gallery exhibitions. While I mainly purchase books for the NCC (though donations are welcome), the DNW Collection is exclusively built by donation. This is one way of trying to ensure that the collection fulfils the purpose to reflect “the New Zealand experience” and the books that were enjoyed by and influenced young New Zealanders. If you have children’s books that you wish to donate to the Library, please do not send in the actual books, as we may not need them. Please send me a list with author (& illustrator, if there is one), title, publisher and date so I can check to see if we need a copy. Because children’s books are usually read many times, they can be in fragile condition when we receive them. This is especially so where the books are very old and have been passed down through generations. We do not have the resources to fully repair the books (there is a world-wide shortage of book conservators), but we do put the fragile DNW Collection books into special acid-free enclosures to stabilise them. Another project is to repair damaged dust jackets and protect them with a mylar wrap – a very sturdy, preservation quality plastic. One of my most exciting projects in recent years has been participating in the creation of the International Children’s Digital Library. The web site (http://www.childrenslibrary.org) provides access to children’s books published around the world, predominantly in English, but in many other languages too. We were there at the very beginning of the Library and I was fortunate enough to speak at its launch in the gorgeous Jefferson Building of the Library of Congress, Washington DC, in November 2002. There were only five very early New Zealand books then, but there are now 48 New Zealand books in the ICDL, in English, Te Reo Maori and Pasifika languages. You can read Piccaninnies there. I am trying to add more books, but publishers are understandably wary of granting permission for books that may well still have commercial value and, naturally, we abide by copyright! It is a great site to visit and explore. The site has really interesting and creative options for searching for books. As well as the traditional subject areas, you can search by twirling a globe, or by whether the animals are real or fantasy, or even by the colour of the book’s cover! You can also refine searches by clicking on more icons, so even very young children can learn to use it independently. Books in the DNW Collection are “reference only”, so you need to visit the National Library building in Wellington to see them. However, we also have over 2,600 19th century children’s books on microfiche and these can be borrowed and used in your library. You can also borrow books from the NCC, via your local library or through School Services. It is one of the oddities of this job that, while the books were written for children, most of my clients are adults. We have a support group for the three children’s literature collections. The Friends of the Dorothy Neal White Collection sends out newsletters and holds children’s literature-related events in Wellington about twice a year. We also have an occasional publication. 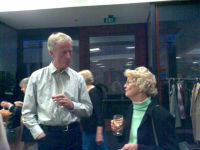 To find out more about this group, and perhaps join, please visit the web site (http://www.dnwfriends.nzl.org). You can find out more information about the collections and the associated services on the National Library of New Zealand web site (http://www.natlib.govt.nz). If you want to contact me, please email me at lynne.jackett@natlib.org, or telephone me on 04 474 3084. I usually work Wednesday, Thursday and Friday, but can alter those days for visiting groups if I have sufficient warning. 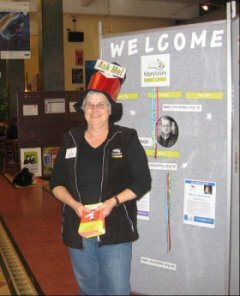 On my days off, I often enjoy taking part in children’s book-related events – usually with Barbara Murison – such as buying the prizes for and marking the Wellington round of the Kids Lit Quiz and the Storylines Festival. We currently have a number of books for sale. The FDNW Scholarship was initially offered for five years. As this time has now expired, the Committee met to review the Scholarship. It was agreed that we should continue to offer a scholarship to a wider pool of candidates. A small committee (members to be co-opted as required) will now meet to further develop proposals for expanding eligibility, changing the frequency and increasing the amount. Once the criteria for the revised Scholarship are completed, we will let Friends know. If you have ideas to contribute, please contact the Committee. Susan joined a small group of Committee members to discuss future developments and management of the Susan Price and Friends of the Dorothy Neal White Collection Scholarships. I started my library career at Wellington City Libraries working on the Ground floor circulation desks. My love of libraries developed long before then, as a school student living in Hamilton. Mum would take my brother and I to the Public Library (then on Worley Place) every Thursday night. We usually stayed until closing, returning home with records, magazines and occasionally books. I now work at the National Library as a Collection Development Librarian and have a daughter of my own. My library day is still Thursday, but it’s now to attend pre-school story time at the Island Bay Library. What I borrow has changed slightly over the years too – now it’s CDs, DVDs and lots of books. So what exactly is a poem? Well, says, Michael Rosen, poems can be short, they can be long, they can rhyme, not rhyme, they can be condensed, epic, lyrical, narrative, sonnets, free form, they can chop sentences in half, turn stories inside out, end before they start, not end at all. They can do what they want to, so long as they create pictures, and if you feel uneasy calling them poems, then call them something else. Rosen, who was yesterday appointed children’s laureate, loves poems. His eyes bulge with enthusiasm, his words gush like lava, and he salivates as he repeats Wilfred Owen’s image of young men in the trenches “bent double, like old beggars under sacks”. The trouble is, he says, educationalists and government ministers have tried to take the fun out of poetry. They have reduced it to a question to be answered in a Sats test, and that is one thing he is keen to change. Rosen could have been created by Quentin Blake, who has illustrated many of his books. He is long, baggy-limbed, smiley and startled-looking – a human hare. All he lacks is a pair of big floppy ears. He exudes warmth and empathy. You want to fold yourself into him. He is 61 years old, but he doesn’t look it. Or act it. Rosen, who has written more than 140 books and presents Radio 4’s magazine show Word of Mouth, was born in 1946 to a pair of politicised teachers – they were both Jewish and had met in the Young Communist League at 16. They fell out with the Communist party after the Soviets invaded Hungary in 1956, but they never gave up on socialism or Marxism. Politics was passed down the family line. “It was mother’s-milk stuff,” Rosen says. He has never been a party man (though he wrote for the Socialist Worker and was great friends with former editor Paul Foot, whose funeral he compered). At university he won a Sunday Times drama competition and his play was performed at London’s Royal Court. He started working life as a trainee at the BBC, did well for himself but was mysteriously asked to go freelance – he later discovered the BBC vetting department had decided he was a dangerous leftie. He returned to his first love – writing. His parents encouraged his creativity; they would have preferred him to be a doctor, but being a poet sounded like a sensible enough job to them. He liked to relate children’s experiences, often in the voices of children, but assumed it was writing for adults. He looks a little embarrassed when I ask him who he would have compared himself to. “Don’t laugh, but I thought it was like the beginning pages of Portrait of the Artist as a Young Man by James Joyce. You could write about your childhood in a way that was in the voice of childhood but that adults would find interesting.” Actually, he says, he really would like to have been a hybrid of Gerard Manley Hopkins and DH Lawrence, with a sprinkling of Jonathan Miller and Peter Ustinov. The lovely thing about Rosen’s writing is that it is rooted in the reality of his own post-war childhood – you can smell the matzo bray (the Yiddish name for a dish made of flatbreads and egg) his father makes as a treat when his mother is out, hear the wheels squeak on his go-kart, sense the thrill of him and his 10-year-old friend Mart on holiday climbing the Sugar Loaf mountain and crossing from Wales into England with their trousers down. Occasionally, the poems make you jolt. A regular character is Harrybo, one of Rosen’s two best childhood friends. We get to know him and his indiscretions, his propensity for nicking toy cars, his unfeasible capacity for eating the radishes and carrots, broad beans and redcurrants from his dad’s allotment. Then a few poems on in You Wait Till I’m Older Than You!, we learn that when Rosen went to the grammar school, Harrybo went to the secondary modern, and they never saw each other again. When he was 38, Rosen visited his old primary school, and discovered that Harrybo had died aged 17. The poem is so immediate, we share the shock with Rosen. “I’d had no idea,” he says. “I’d written all these poems about him and I’d wanted one day to meet up with him, and say, ‘Look, this is the go-kart and this is the nest, and this is all that stuff.’ This was before Friends Reunited. It was like my own Friends Reunited. The hope that one day he’d ring up and say, ‘It wasn’t like that, I did let you have a go on the go-kart, you know.’ And I would have said, ‘No you didn’t, actually,’ and we could get into a wonderful argument about it.” But it wasn’t to be. Rosen has had an elaborate domestic life – three marriages, and seven children, including two stepdaughters. The children are regulars in his poetry, none more so than Eddie, his second oldest. It was Eddie who drove the car into a ditch in France, Eddie who screamed in the supermarket when stuck in the trolley, Eddie who played goalkeeper on the sofa with his father. Rosen fans know Eddie well. When Eddie was 18 he became ill one night, and the next day he was dead. His death, from meningitis, almost destroyed Rosen, who wrote a devastating adult anthology about his loss called Carrying the Elephant, and the equally poignant Sad Book for children. After Eddie died, Rosen went to France with Eddie’s mother and he came across a postcard of a man carrying an elephant. Eddie had started working in the theatre, and had already written a play when he died. Sometimes, Rosen will do a show, and a child in the audience will talk about the funny Eddie poems and ask about what happened to him. “And in the middle of all this laughter and chaos, I have to say he died. I always say it – he died. And you see the adults in the room freeze. It’s funny; children don’t do that. Adults literally become rigid, but children go, ‘Oh, right, I like that one where he …’ It’s like that’s what happens at the end of life – you die. Children know that. They might not feel it in themselves yet, but it isn’t loaded with all that …” He trails off. He asked the obvious question: why? He asked it time and again, and received no answer. He decided to write about Eddie’s death. “It helped me understand it all. If something awful happens like somebody close to you dying, there is a complete lack of comprehension. You can’t figure out why it should have happened and why it should have been you, and then you notice it’s not just you.” In a way, he says, he nurtured his self-pity, wanting to believe that he was the only person who had suffered such loss. But in writing about it, he began to put it in perspective. “Just a couple of weeks ago, somebody asked me to do the one about Eddie’s birthday and they didn’t realise he’d died and I said, ‘Yes, sure. '” He began to realise, or accept, that many people have suffered terrible bereavements. Perhaps imagination and an undiminishing sense of wonder are the keys. It’s amazing, he says, how young children are when they have that sense of play drummed out of them. “On my geography homework I wrote, ‘It’s windy here on Windermere,’ and the teacher put a line through it and said, ‘You won’t have time for that kind of thing in the exams! '” He belly-laughs. And sold her to a couple of newly weds. To go off in to get married. I’d say more money than they knew what to do with. They did tie the knot. Somewhere on the other side of the earth. People said the ring was huge. Huge – but very, very cheap. It had been used for something else altogether. Or the one who proposed. And I was never told. Was the one who introduced me to them. But he chose to keep quiet about it. I’d be amazed if the paint lasted. You can have the rest if you like. Now what sort of green would you call that? The New Zealand Post Book Awards for Children & Young Adults reward excellence in children’s literature, recognising the best books for children and teenagers published annually in New Zealand. The award was presented to Marcia Stenson by New Zealand Post’s Chief Executive Officer, John Allen at the awards ceremony hosted by the Hon. Judith Tizard, Associate Minister of Arts, Culture and Heritage, at Parliament on Wednesday 16 May. This year’s judging panel of three children’s book experts, convened by illustrator, writer and teacher, Keith Olsen, said their experience offered them a unique overview of the state of writing and illustrating for young people in this country. They were happy to report that there is considerable strength and depth in both the artistic, and the business side of children’s book production in New Zealand. Olsen was joined on the judging panel by Ainslie Heather and Dylan Owen, with backgrounds in children’s book retailing and librarianship. The winner of each category was awarded with $5,000. The winner of the New Zealand Post Book of the Year Award takes home an extra $5,000. The winner of the Best First Book and the Children’s Choice Award receive prize money of $1,000 each. The honour awards were presented in two categories this year. These awards are discretionary and are awarded in recognition of particular features in each book. Judges for the New Zealand Post Book Awards are selected from nominations put forward by a range of literary and book trade organisations with an interest in children’s literature. Wherever possible one of the judges will be a practising writer. The members of this year’s judging panel share a wealth of experience in children’s book writing, illustrating and children’s literacy spanning many years. 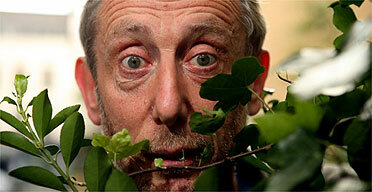 Keith Olsen, a South Otago-based illustrator, writer and teacher, is the convenor of this year’s judging panel. His illustration work includes both fiction and non-fiction titles and he has a particular interest in book design. Keith has twice been a finalist in the Non Fiction category of the New Zealand Post Book Awards as an author, illustrator and designer. In 1998 he was the Non Fiction category winner with The Know, Sow and Grow Kids’ Book of Plants written jointly with his wife, Diana Noonan. He sees the New Zealand Post Book Awards as providing a focus for a heightened interest in reading, writing, and publishing books for children and young people. Ainslie Heather was the Children’s Book Buyer at University Bookshop Otago for five years before becoming the Librarian at the Port Chalmers Library. In these roles, she says she has enjoyed a ‘front-seat’ view of New Zealand’s wonderful children’s books, writers and of the market for children’s books. Ainslie says there have been some really exciting developments and growth in New Zealand children’s literature in recent years. These changes reflect New Zealand’s diverse and changing population, ideas and issues, while maintaining the tradition of high quality, imaginative writing.